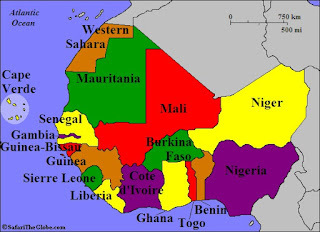 DAKAR, SENEGAL (AP) — Drug trafficking is a growing problem in West Africa as the production of synthetic drugs and their use are increasing in the region, a report by the International Narcotics Control Board said Wednesday. West Africa has, for some time, been a major transit region for drugs, such as cocaine, produced in South America going to Europe. Guinea-Bissau and Mali remain vulnerable transit points, according to the United Nations Office on Drugs and Crime. The region has also become a focal point for trafficking stimulants, like methamphetamines, to East and Southeast Asia, and the substances are now more locally consumed, it said. "In West Africa, we see an increase of trafficking of drugs in general," said Erik Van Der Veen, Sahel coordinator for the U.N. Office on Drugs and Crime. "The production of synthetic drugs are increasing in the region. Because of that, there's higher use in the region." Illicit production and distribution centers have emerged in Ivory Coast, Guinea and Nigeria, and a significant amount of such stimulants have been seized in West Africa over the past year, the report said. Nigerian authorities dismantled 10 meth labs between 2011 and 2015, the report said. Authorities in Senegal have also seized chemicals used to make drugs. Heroin and cocaine traffickers are now also targeting Africa's growing middle class, especially in countries such as Benin that have served as transit points, the report said. Increased drug production and consumption leads to growing public health concerns in a region that does not have the capacity to address such issues, the U.N. office said. Senegal is the first country in the region to set up a drug treatment center, it said. The organization called on governments to comply with international law, saying "impunity and corruption both result from and facilitate further drug-related crimes.